Applicable Ages: 12 – 18. Open to boys and girls. Eligibility requirements: Two years of study and ensemble experience on an instrument prior to camp preferred. Negotiable based on skill level. MMA’s Band and Orchestra Camp is an intensive one-week, music-enhancing experience designed to encourage students, fuel their musical enthusiasm and take their playing skills to the next level. Students participate in vigorous daily rehearsals, musicianship classes and one-on-one guidance. For aspiring music directors, there are opportunities to learn conducting techniques. Day camp or residential camp available. In the evening, students can enjoy many of MMA’s wonderful activities and facilities, including: swimming, paintball, rappel tower, assault course, gym activities and movie theater. At the end of the week, students will perform a concert on Friday. Concerts will be open to the public and free to attend. MMA’s Band and Orchestra Camp is a rewarding opportunity for young people to enhance their musicianship. 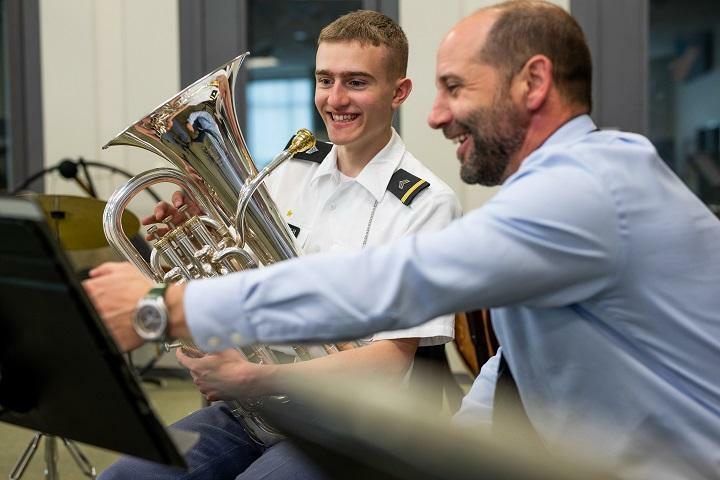 If your son could benefit from our program, contact Director of Music Freddie Lomas at freddie.lomas@missourimilitaryacademy.org or at 573-581-1776 ext. 431. Please note that limited spaces are available based on instrumentation, so please sign up early to guarantee your young musician's spot.